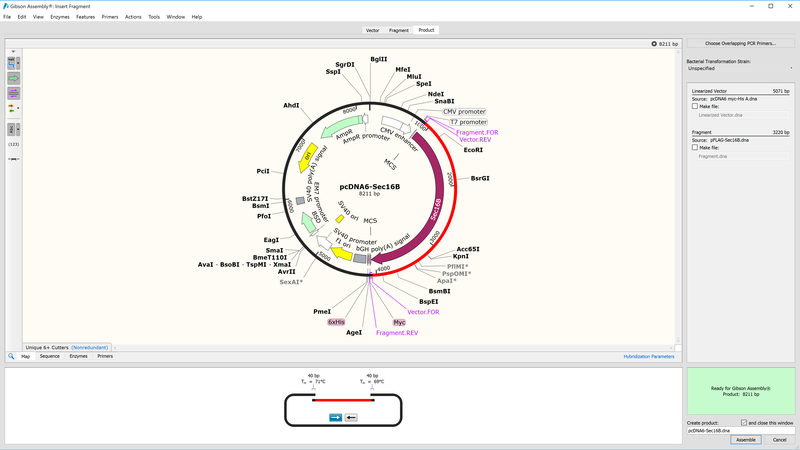 Gibson Assembly is a popular way to insert fragments into a plasmid without using restriction enzymes. To simulate this method, SnapGene provides an intuitive interface. For Gibson Assembly, PCR amplify the DNA segments to create overlapping ends. Then incubate the amplified products with assembly enzymes, and transform the mixture into bacteria. SnapGene simplifies Gibson Assembly by automating the primer design. To plan a Gibson Assembly reaction, just select the DNA fragments that you wish to join, and SnapGene will choose suitable primers. Please click below to see a screenshot and a brief tutorial video.